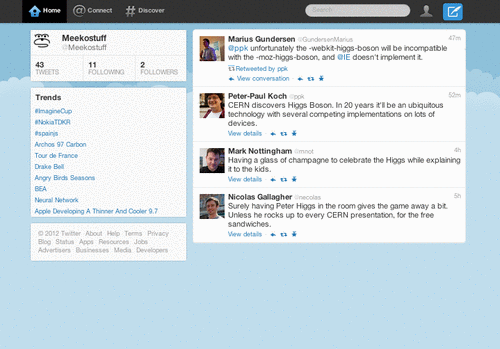 Late in May 2012, Twitter began migrating its twitter.com site from hashbangs to plain-old-URLs. This was done for a number of reasons, but one of the higher priorities was improving performance, most notably "reducing the time to first tweet". The scripted page navigation that was facilitated by using AJAX and hashbangs is (will be) replicated by using AJAX and history.pushState() (on browsers that support it). 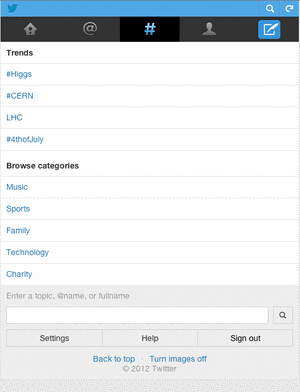 What's still wrong with twitter.com? Bandwidth. 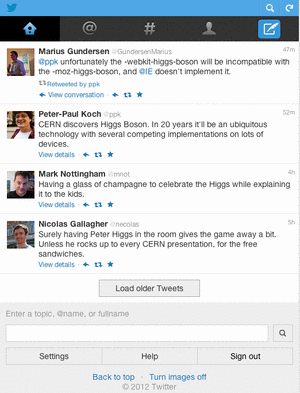 Before the migration, Mike Migurski complained about an initial download of up-to 2MB for viewing a single tweet. 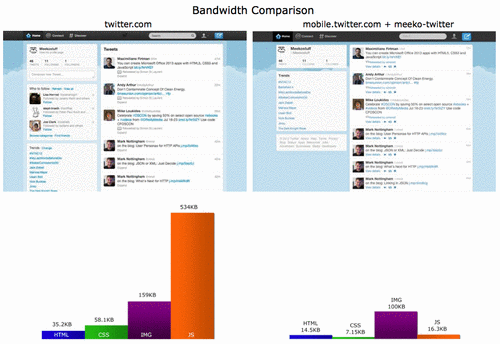 The bandwidth for a single tweet is better now (and the initial startup is faster) but the site is still very heavy for what it does, and 2MB on initial page-load is still observable. How could it be fixed anyway? 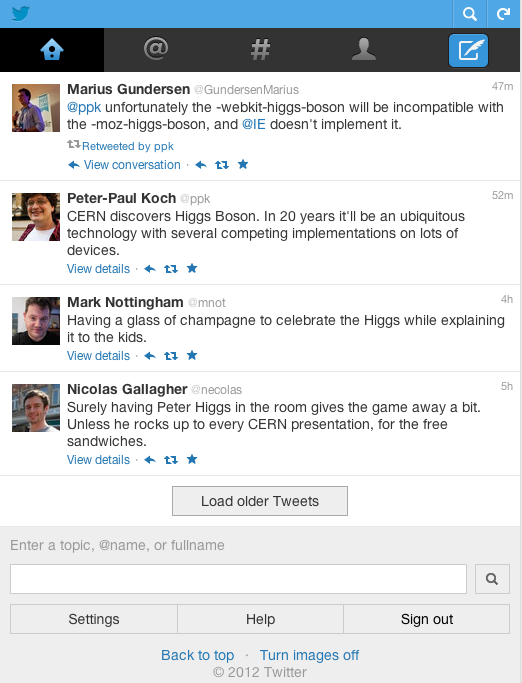 What if Twitter had applied a mobile-first / content-first strategy to the twitter.com upgrade, using mobile.twitter.com as the starting point and relying on progressive enhancement in the browser to provide a richer UI? twitter.com has corresponding pages, but with a richer UI plus page-specific auxilliary content. There are, however, only a few variations on page-layout and, conveniently, all the pages on twitter.com can be represented by one page template consisting of multiple panels, each of which may be separately hidden (or populated and revealed) as appropriate. The following picture illustrates this single page-template, with labels on various panels (and also some source directives which I will explain later). 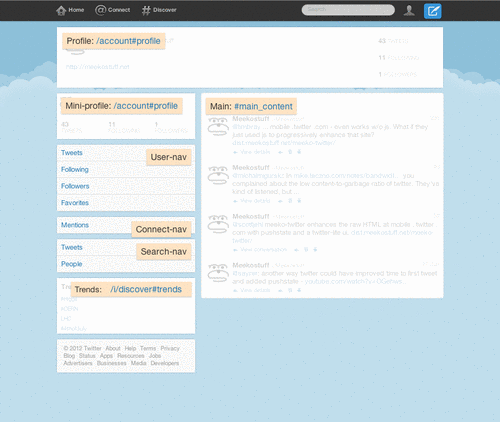 this page-template is loaded as the content of the window (with all panels hidden). the main panel is populated with the main-content of the page and shown. appropriate auxilliary panels are populated and shown. 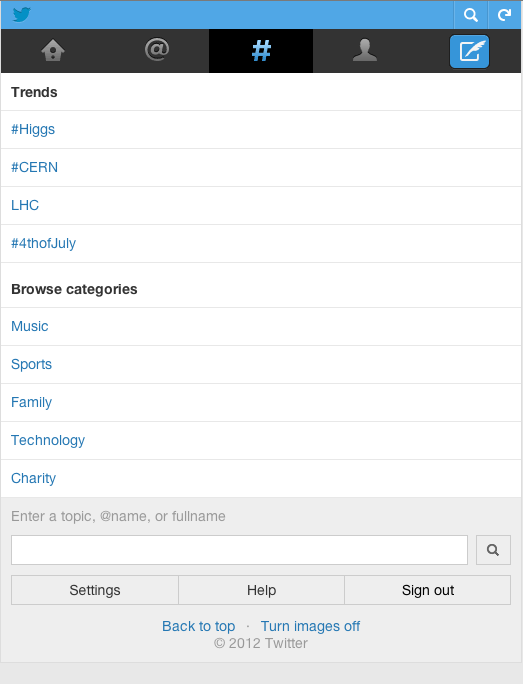 What changes need to be made on mobile.twitter.com? a script must be added to each page. ideally the script would prevent the page content from being displayed until after the page-template has loaded. This requires the script to be in the <head> of the page. we don't want to hard-code the page-template location into the script, so a js config call or HTML element could be used to specify it. The <link> element is designed for this purpose so probably use that. No changes are necessary to the <body> of pages, however there are some pages which have main-content that we don't want to be placed inside the main panel. 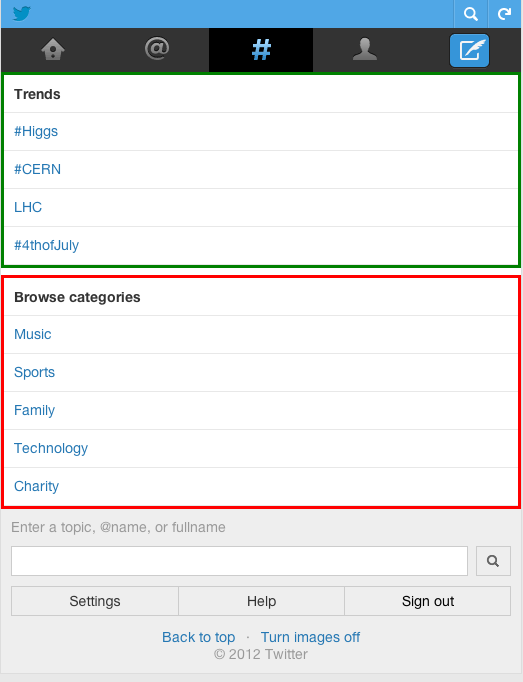 The following pictures illustrate this by outlining the page-content desired for the main panel (red) and secondary content (green). This could be handled by changes to the server-generated pages, but since our enhancement is extracting the relevant content anyway, it is trivial to rearrange the page when it is received to move the secondary content outside of the main-content container. How are the auxilliary panels handled? if the panel requires site-content then a background task is initiated to fetch the content and populate and show the panel. if the panel doesn't require site-content then it can be shown immediately, although there may need to be pre-processing to make the panel content match the page. e.g. 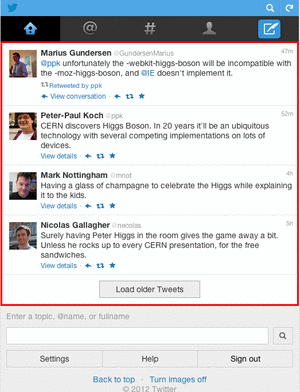 hyperlinks in the user-nav panel would need updating to match the user_id. 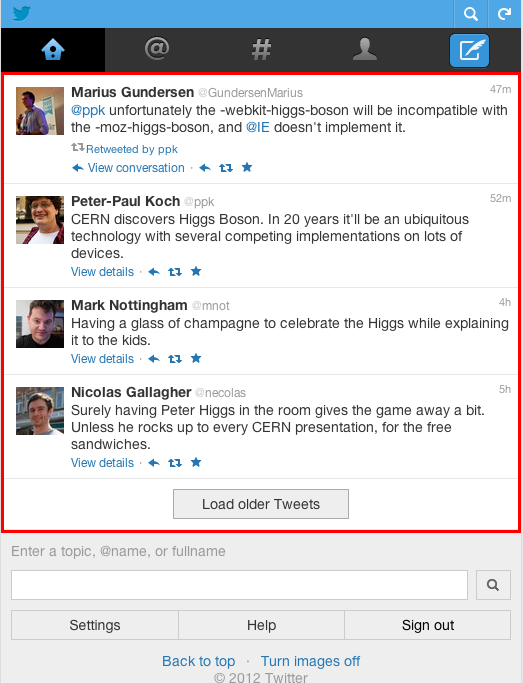 What about popup dialogs for composing / replying-to tweets? While posting tweets to mobile.twitter.com will have a specific format, the overall process of wrapping a form in a dialog popup and serializing the form-data to post with XMLHttpRequest is hardly novel and is left as an exercise to the reader. on browsers that don't implement pushState, each page will be loaded in full, including the real content and the UI. At least with this approach the UI (the page-template) will already be cached. even when the page-template isn't cached, the server can send the <head> of the content document immediately, while it continues to lookup the appropriate main-content. This allows the browser to initiate fetching the page-template before the main-content has arrived. this approach is effectively using the mobile.twitter.com site as a REST API that delivers HTML responses, in a similar way to how twitter.com uses the api.twitter.com site, but without the complication of authenticated cross-site requests. 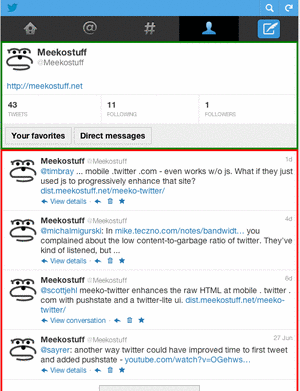 meeko-twitter DOES NOT necessarily require history.pushState() support from the browser, but without it the bookmarklet would need to be manually run after each page navigation. Obviously this would be automatic if this approach was built into the site. This is the primary reason Internet Explorer is not supported. 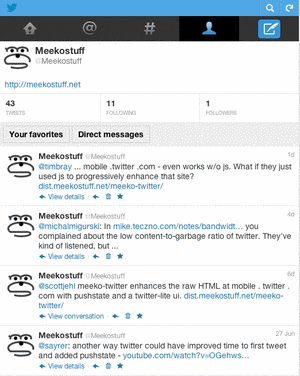 meeko-twitter uses CORS XMLHttpRequest to load the page-template (although this could be worked around by a JSON-P approach). This is the secondary reason Internet-Explorer isn't supported. 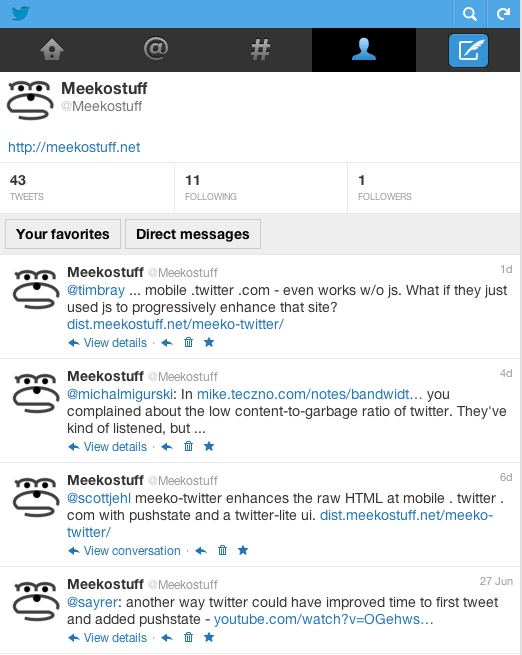 this design DOES NOT cover content caching, although meeko-twitter DOES implement it. this design DOES NOT cover content updating. meeko-twitter DOES NOT either. mobile.twitter.com uses <table>s for layout. I am NOT endorsing tables for layout, and meeko-twitter DOES NOT depend on their presence. content-first and mobile-first are similar concepts which could also be described as extreme progressive-enhancement, where non-essential content of a URL may also be added via scripted enhancement. HTMLDecor is the term - and JS library - I use for enhancing content-first pages with site-decor (and history.pushState() where supported). hinclude and Ajax-Include are JS libraries for conditionally or lazily including parts of other pages into the current one, in a similar manner to the way auxilliary panels are populated in meeko-twitter. If you have any questions, or if there are errors or omissions in this article, feel free to contact me via the contact dialog on this page.